General use: Dilute Fast Lane 1:40. Super Gloss Enhancing: Dilute Fast Lane 1:8 Allow to dry. Burnish to a high gloss with a machine and appropriate nylon pad. Spray Cleaning/Burnishing: Dilute Fast Lane 1:20. Spray a fine mist on the floor in front of the machine (using a nylon pad) and burnish lightly until dry. 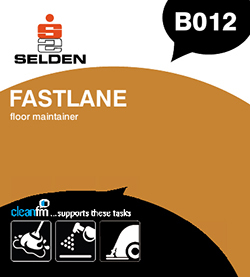 Use with Scrubber Dryer: Dilute Fast Lane 1:100 N.B. Do not over apply. N.B. Not suitable for unsealed wood, unsealed cork or laminated flooring.